Trader & Supplier of Magic Shampoo & Black Hair Magic Shampoo. Our product range also comprises of Whitening System, Scalar Energy Pendant and Bio Energy Cards. And all MLM products we are the direct importers. 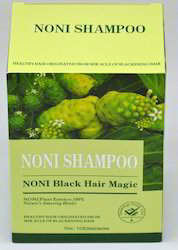 We are amongst the most prominent enterprise actively engaged in impoting wholesaling, trading, retailing, and supplying a comprehensive array of Noni Black Hair Magic Shampoo. Help to in growth of your hair by removing problem of hairs like white hair problem, dandruff and fallen hair, using the best quality ingredients, the offered shampoo is made in compliance with the quality norms. To meet the variegated demands of our esteemed clients, we are engaged in offering a comprehensive range of Noni Black Hair Magic Shampoo. Its cures the white hair problem, dandruff and fallen hair, the offered shampoo is made using finest quality ingredients in accordance with the set of market norms. In order to meet the individual needs of our customers, we provide our shampoo in different bottles. Apart from that, our offered shampoo can be availed by our clients at nominal rates. Turn your hair black in 5 Mins easy to use. Onyx Magic Natural Black Instant Darkening Instant Hair color Shampoo Made from herbal extracts and herbal nourishing cream such as wild ginseng, wild ganoderma lucidum and so on. Onyx Magic Natural Black Instant Darkening Hair Dye shampoo (natural black) has been developed after two years of research. A combination of various fruit essence and herbal extracts, it rapidly turns your hair black safely. It clears dandruff, supplements nutrients to the roots of the hair and effectively prevents hair loss. Wet your hair and then wear a pair of gloves, take adequate amount of the product and massage it on your hair for 5- 6 minutes, wash off with water. 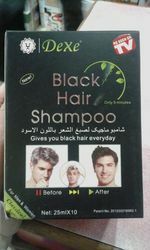 We are offering Black Hair Shampoo to our client.